I want to share another website I found, an Instagram account called Daddy Doin’ Work. In a way, I don’t like the title of the account, because it seems a little patronizing – of course daddies work. (In fact, my daddy worked so much as a lawyer that he didn’t come home for months at a time. Or so I believed until I was embarrassingly old and realized he had other homes with other women.) His abuse notwithstanding, I know there is a huge stereotype of men not engaging with their children that is untrue and unfair. I think this guy is the one who started the page, with one of his kids. 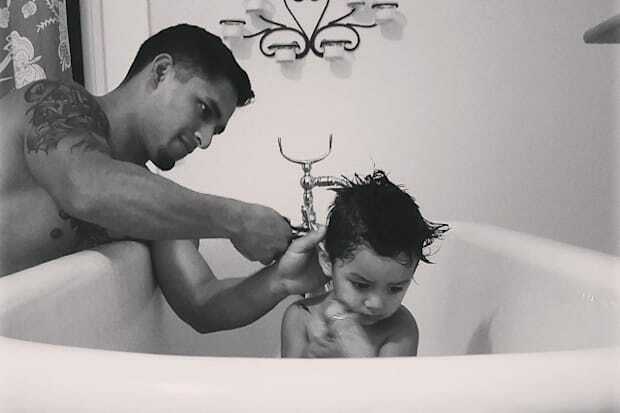 Do you have stories about daddies in your life doin’ work? Sadly, there never was a daddy doing anything, at least in my memory. I had a friend whose daddy felt it was his personal responsibility to ensure the bar of the Kings Arms didn’t collapse, and another friend who was daddy to a number of others, not all in the same roost. Come to think of it, almost every daddy relationship I’ve known had some sort of complication. Maybe that’s the norm?